Lynx Africa has been our best selling fragrance for over a decade so why not take it one step further? Lynx Africa is now available as an anti-perspirant Stick and provides 48 Hour Fresh Protection and is part of the Lynx male grooming range, with a subtle, refined men's fragrance. An exotic mixture of warm African spices and aromas, this classic fragrance will give you a real presence. A quick application is all you need for a lasting, great smelling protection. Stay fresh all day with Lynx Male Grooming. For optimum use apply to the underarms after showering and once dry to start your morning and fight off style-threatening bacteria. Whatever the occasion, it lasts all day long. Avoid contact with your eyes and broken or irritated skin. 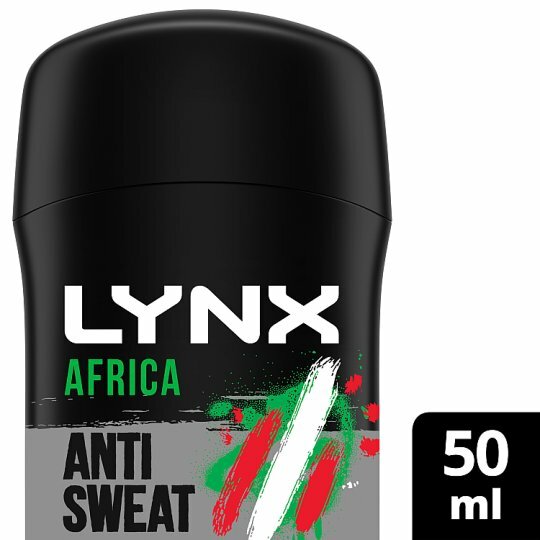 Lynx Africa Anti-Perspirant Stick Deodorant provides up to 48 hours sweat protection, keeping you (and your shirts) feeling fresh, clean and dry no matter where the heat’s coming from. Take it one step further and boost your style and sweat protection with Lynx Africa Body Spray 150ml and Lynx Africa Body Wash 250ml. Why not also try Lynx Daily Fragrance, a sophisticated every day fragrance for men? Refresh your style with Lynx Signature, Adrenaline and Urban Daily Fragrance 100ml.